Kebony has opened a factory in Belgium, marking the beginning of a new chapter for the company which will see it expand its domestic and international business. The new production site was officially opened by Philippe Muyters, Flemish Minister for Work, Economy, Innovation and Sports. Kebony has experienced continued annual growth with international sales rising by an average of 30% year-on-year for the last seven years. The new factory will enable it to double its annual production capacity to 20,000m³ of Kebony Clear wood. The company’s original factory in Norway will continue to specialise in the production of Kebony Character wood whilst maintaining its status as the company’s research and technology hub. The new factory is ideally located to benefit from a variety of European connections and its proximity to the port of Antwerp will allow the export of Kebony products to European and oversea markets like the USA to become more efficient and cost-effective. 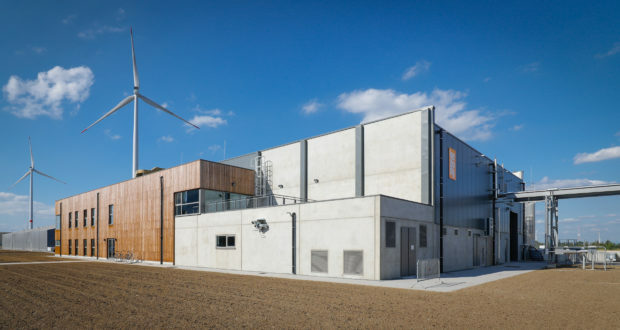 It is also situated close to Kebony’s machining partner, Rudy De Keyser, in Kruibeke, supplier of FA, TFC in Geel and next to the site of the chemical company LANXESS, at the Scheldt Chemical and Industrial Park (ScCIP) in Kallo, which will deliver utilities and site services to the new factory. Construction of the facility was delivered within budget, with funding supplied by European investors including the Flemish investment company PMV and SFPI-FPIM. With limited additional investment, the new facility in Flanders would have the potential to quadruple its current production to approximately 80,000 m³of Kebony wood. The factory will support Kebony’s plans to accelerate sales in the coming years and will act as a catalyst for significant international expansion in key central European markets like Germany or France. Developed in Norway, the patented Kebony technology, which has taken years of research and development, enhances the properties of sustainable softwood with a bio-based liquid. The process permanently modifies the wood cell walls giving Kebony premium, hardwood characteristics, resulting in significantly improved durability and structural stability.